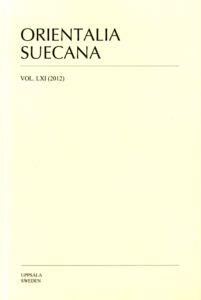 Orientalia Suecana is a peer-reviewed, open access, international journal edited at the Department of Linguistics and Philology, Uppsala University. It publishes contributions on languages and literatures within the following fields present in the Department: Semitic, Iranian, Turkic, Indic, and Chinese studies. Orientalia Suecana adopts the Diamond Open Access publishing model that provides free access to peer-reviewed journal articles without charging article processing fees. All articles are published under the Creative Commons Attribution 4.0 International (CC BY 4.0) license. Authors retain copyright of their publication with no restrictions. Orientalia Suecana uses an open peer review model according to which the identity of the author(s) and the reviewers are known by all participants. All submitted material will undergo peer review by at least two scientific experts independent of the editorial board before acceptance for publication. Peer review and editing are done by volunteers working in academia. The articles are published individually after final proofs are returned by authors.